Is Trump’s ‘Birther’ hit on Cruz legitimate? 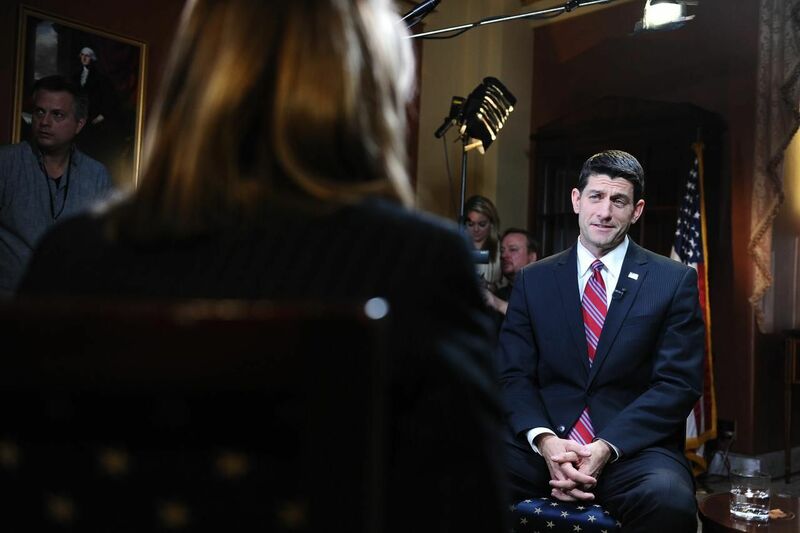 Speaker Paul D. Ryan, R-Wis., continued his offensive against President Obama’s just-announced executive orders on guns, telling Yahoo News’ Katie Couric in an exclusive interview Wednesday that he wished the president had demonstrated “the same kind of [emotional] reaction” in response to the killing of American journalist James Foley by the Islamic State. In the 24 hours since the president’s announcement that he would direct more government resources toward enforcing current gun laws, Ryan has reiterated that he believes Obama should be more focused on fighting ISIS. The speaker, who dismissed the executive orders as a “distraction,” was especially forceful when he invoked Foley’s death, implying that the president fell short in his compassion for the victims of Islamic State terrorism. Though Obama did not openly cry while delivering his statement in August 2014 mourning Foley, he did say repeatedly he was “appalled” by Foley’s execution in a speech that had its share of emotional moments. Republicans, and especially Ryan, the most powerful member of his party in Washington, consider Obama’s Middle East policy weak and ineffective, explaining why Ryan would bring it up in the context of a seemingly unrelated question about the new regulations on gun sales. “I see it as a distraction. … What I think he’s trying to do is distract from basically his failed policies,” Ryan said of the executive actions. “I think a week [when] we can talk about gun control is a week we’re not talking about our failure to confront ISIS fully, the failure to take care of the threat that’s on our doorstep. “I think the president should put as much effort into going after homegrown Jihadists and going after terrorist infiltration of our refugee network and going after defeating ISIS than he is in trying to frustrate the law-abiding citizens’ Second Amendment rights,” Ryan continued. In 2015, there were approximately 50,000 recorded incidents of gun violence in the United States, including almost 13,000 deaths by homicide, unintentional shooting or murder/suicide, according to the Gun Violence Archive. The speaker urged the president to better enforce existing gun laws — exactly what the administration said it was doing in the executive actions Tuesday, which among other things directed more resources to the Bureau of Alcohol, Tobacco, Firearms and Explosives and the FBI for monitoring gun sales and conducting background checks of buyers. Besides being an election year, 2016 also will be Ryan’s first full year as speaker, and one of his first major events of the year will take place this weekend in South Carolina, where he and home-state Republican Sen. Tim Scott will hold a forum to discuss poverty. Several Republican presidential candidates, including Jeb Bush, Chris Christie and Ben Carson, are expected to participate. Though Ryan has proved himself to be an adept political foe of Obama —a skill he honed as Mitt Romney’s running mate in 2012 — an early focus of his speakership has been on substantive policy issues, especially legislation aimed at reducing the size of the federal government. Ryan dismissed longstanding Democratic claims, which began at the time he unveiled his first budget proposal in 2011, that people at the bottom of the income scale would be hurt by his plans to make cuts to federal safety net programs like Medicaid, Medicare and Social Security. Ryan hasn’t endorsed a presidential candidate and would only say Wednesday that whoever the GOP nominee is would make for a better president than Obama. He also denied that the Republican Party is divided over its future.